Hello all out there in the blogsphere! 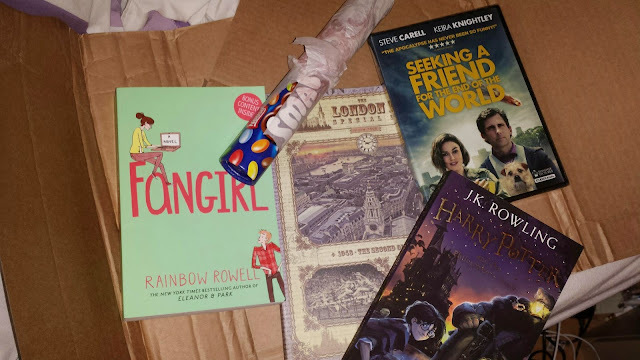 Today I bring you an update on the latest #NinjaBookSwap and what sent and received! So, I was tasked with sending a parcel to the lovely Holly at Lost in a Library and was determined to integrate her love of Owls into the parcel and of course the books. She received a copy of Graceling by Kirstin Cashore and Lies we tell ourselves by Robin Talley. 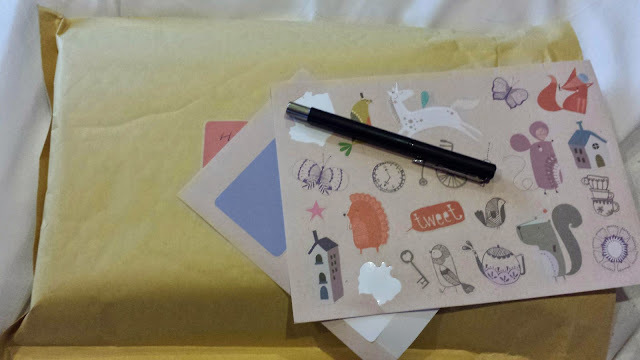 As a gift I sent an absolutely gorgeous owl letter writing kit that I would have loved to have kept to myself! So Holly please use it well! Below you can see a little teaser picture I posted to twitter as a little clue! Today i recieved this package from Shazina at The Book Chapter and I have to admit, I was so surprised! It contained Chocolates, (That have now been removed from that tricky tissue paper!) Fangirl by Rainbow Rowell, a book that I have been meaning to get eventually but other books keep distracting me, the beautiful new edition of Harry Potter and the Philosopher’s Stone (Look out for a post about books, editions and love over time). That wasn’t all though, she also sent Seeking a friend for the end of the World and a simply fantastic notebook which is screaming at me to be doodled in. Even my cat loves this parcel, he just sits beside it and makes sure it doesn’t move! Thank you so much! I feel extra lucky!! Those of you who read my last post about the Ninja Book Swap will understand what it is but for all those new to this, it is a chance for bloggers to connect and share their favourite books and thoughts with others in the community through this fun and entertaining medium. You can sign up for email reminders for the next swap or follow the blog here. I really do recommend joining the swap next time it comes around as you will make someone else happy as well as you being happy when you receive a fantastic parcel! So was I, it kept saying eat me, eat me. Fangirl was a very good read aswell, the character building was simply superb!